The Power & Perfomance stack is designed to promote those intense, focused workouts while keeping your energy and performance locked in daily. Arginine Alpha Ketoglutarate (AAKG) is the primary ingredient in most pre-workout, cell volumizing supplements. It's an amino acid compound that's been shown to help increase muscular 'pump' and vascularity as well as the delivery of blood, oxygen and nutrients to the working muscles. Ornithine alpha ketoglutarate (OKG) improves the performance of athletes by speeding muscle recovery time while boosting protein synthesis. Ornithine alpha-ketoglutarate, is an advanced anabolic and anti-catabolic amino acid supplement designed for serious strength athletes. Summary in a few words...it feeds your muscle rather than muscles eating themselves by going catabolic while increasing oxygen and pump to muscles while speeding up recovery. SUGGESTED USE: 3 tablets taken 1 to 2 times daily between meals or before and/or after exercise with 8 ounces of water or as directed by a healthcare professional. CREATINE MONOHYDRATE - Creatine is a nitrogenous organic acid that occurs naturally in vertebrates and helps to supply energy to all cells in the body, primarily muscle. This is achieved by increasing the formation of adenosine triphosphate (ATP). This component focuses on strength & mass. CREATINE PYRUVATE - Creatine Pyruvate is a combination of Creatine and Pyruvate, both of which are impressive ergogenic (energy) producers and have been highly touted for building muscle and reducing body fat. This will primarily focus on the absorption of all components. SUGGESTED USE: 3 tablets taken with fruit juice 1 to 2 times daily, before and/or after exercise or as directed by a healthcare professional. It may be advisable to take this product in cycles: 4 to 6 weeks on, then 4 to 6 weeks off. Normal testosterone levels contribute to a healthier libido, prostate health, fertility, and better sexual function and satisfaction. Normal testosterone levels also encourage muscle development and contribute to weight loss. It is also known to help maintain energy levels, contribute to better sleep, stabilize mood, and promote a greater ability to deal with stress. All of which are known to decline with age and the onset of andropause. 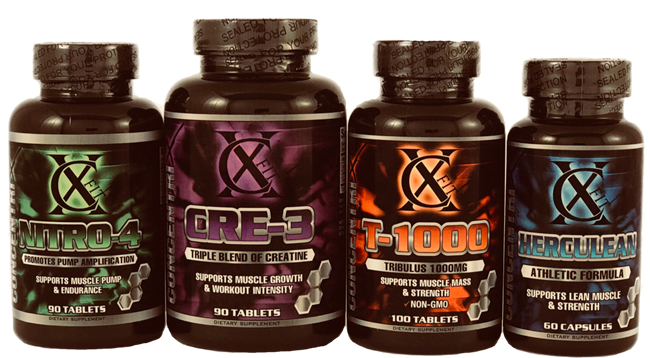 Simply stated, a man needs normal testosterone levels to stay fit and feel energized. Tribulus terrestris supports normal testosterone levels. Apart from its claims for improvement of sexual functions in men, the puncturevine plant (Tribulus terrestris: TT) has long been considered as an energizer and vitalizer in the indigenous system of medicine. Tribulus terrestris - has been used for medicinal purposes for centuries. Over the last two decades, this plant drew the attention of many bodybuilders, after several scientific studies have shown its potential in increasing testosterone and luteinizing hormone levels. Learn Nitro-4 in under 1 minute. Learn Cre-3 in under 1 minute. Learn T-1000 in under 1 minute. Learn Herculean in under 1 minute.